A thread about getting on with the job with whatever tools are to hand. 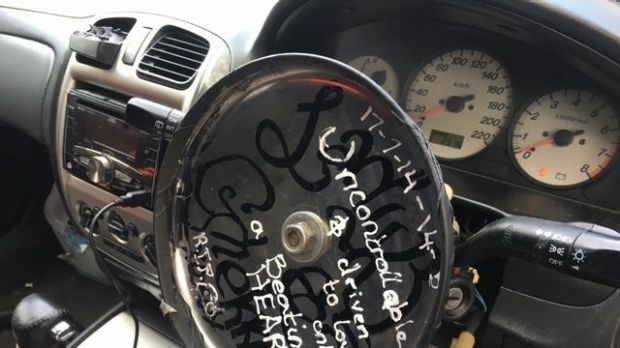 Driver is fined for using frying pan as steering wheel! Oven mitts required in summer to steer. A local paper reported that a driver was stopped and cautioned a couple of year ago when he was found to be driving with a pair of mole grips round the steering column instead of a steering wheel. I have some photos of another car that was stopped in a very rural area with a long length of garden hose wrapped round the wheel. Obviously the tyre had shredded at some point so the driver had kept wrapping hose around the wheel until the bulk of the hose meant that the wheel rims weren't in contact with the road. 3 or 4 day stop in Karachi without booze, so bought a roll of hose pipe in London and equipped it with screw caps on each end, then en route to Karachi filled it with company gin. Trouble was - they had to fill it to avoid air bubbles showing and giving the game away, and they hadn't reckoned on how much gin it needed, which added to the weight to be nonchalantly thrown over the shoulder of the crew member tasked with getting it through customs. The subterfuge worked, but they had to drink a lot of gin. No problem. View Next Unread "Leaders of the Free World"